Circa 1850 - Centrally located on a quiet street in Historic District, we are a short stroll to beach, town, shopping, museums, amazing restaurants, and nightly entertainment. Our home offers all the Charm of Victorian Cape May and all the Up to Date features of a new home. Spread out on the large screened in porch and enjoy a beverage and maybe some fine cheese. Relax you are at the beach! Our main goal is to provide an exceptionally clean, comfortable home for our family and guests to create lasting memories they will cherish a lifetime and I know “Porch Time” will be part of that. Just inside the front door is a welcoming living room with clean lines and tranquil colors, gorgeous old hardwood floors said to be made from the decking of old whaling ships. Comfortable sofa’s and easy chairs provide ample room for the whole family to sit and talk or watch a ballgame. The spacious dining room has a nice open feel with a door and window to access the side screened in porch in addition to the kitchen and breakfast area which also has direct access to the screened side porch. The kitchen is well stocked with most everything you will need to cook for your family. We routinely have 16 to 20 for dinner and enjoy cooking for the whole crew. Just recently renovated in 2012 the kitchen is a great mix of new granite and tumbled marble backsplash and old antique pieces. The island is a huge antique chemistry lab table and is a great work space and area to stage a large meal and the Viking Range is a great bonus. Off the kitchen is a second large screened in porch with comfortable chairs and couch. There is also a half bathroom on the 1st floor. The second floor consists of 5 bedrooms and 2 bathrooms. The 2nd Floor Master Suite has a very comfortable Queen bed in well appointed room along with a Full Bathroom with Shower to maximize privacy. Other bedrooms include a second Queen bed, two bedrooms with Double Beds and a bedroom with 2 single beds. There is also another Full bathroom with a Bath/Shower on the second floor. The 3rd floor Master Suite has a very comfortable Queen bed in a well appointed spacious room we call the “Tree House” because one wall of the bedroom is a sliding glass door onto a private Screened in porch and you feel like you are living in the large tree outside. This room is attached to a full bath with Shower. The house is fully equipped with Cable TV, Phone, Wi-Fi Internet, DVD/CD, central air conditioning/heat. Both the Dining Room, Breakfast Area and Screened Back Porch make a great location to gather for meals. Warm, comfortable, well-equipped, and very clean charming Victorian home. Our combined family of 11 fit comfortably in this wonderful and charming home, which had been thoughtfully updated in all the areas where such updating is important - the kitchen and the bathrooms. 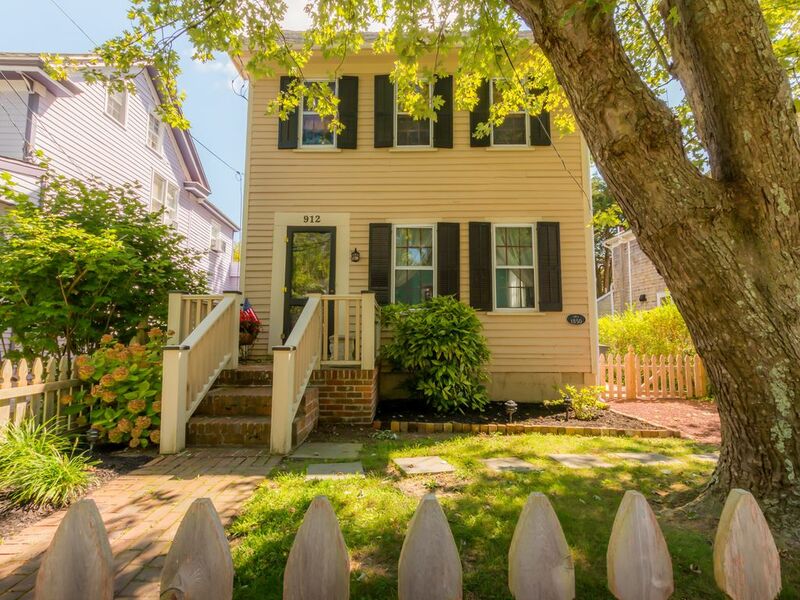 The home is located on a lovely quiet street close to the beach and the little village of Cape May. We spent much of Thanksgiving week there and we all felt it was one of our best experiences renting a cottage at the beach at any time of the year. The owners were most attentive to our needs and expectations. We certainly recommend this property and it’s owners with the highest praise. While in town for our son's wedding at Congress Hall in Cape May, our family of 6 adults and 3 grandchildren ages 2-4 stayed in this well kept home. It is about 160 years old, and of interest to people who enjoy old homes. It's conveniently located to Cape May and well kept. The kitchen is spacious and eating space in the kitchen and dining room will seat a large number of people. Kitchen is well stocked with cooking pans, bowls, plates, silverware and utensils. The third floor bedroom called “The Treehouse” is absolutely beautiful and peaceful – we didn’t find it at first though due to the number of doors on the 2nd floor. The second floor bedroom with twins beds (trundle) are in the room that leads to the 2nd floor “master/with bathroom” and the doorway to the third floor, so we had to change our planned sleeping arrangements – couldn’t have kids in there with adults traipsing through on their way to their own bedrooms. The mattresses on the 2nd floor were difficult for three of our sons who need firmer mattresses for their backs. There is a small childgate at the house. We brought our own and definitely needed to block the bottom of the steep wooden stairs from our toddlers. The fenced backyard is nice for pets and young children and contains two charcoal grills. There is even an outdoor shower in back. The front yard can be fenced as well, if you choose not to park in the disguised parking space next to the front yard and latch the gate instead. The landlords were easy to communicate with as we were making plans and very responsive to our questions. They provide lots of information about the home and the town with helpful suggestions. We had a wonderful time in this home and Cape May is a lovely town, well known for birdwatching and its beaches. Wonderful space! Great location. Wonderful and responsive hosts. Wonderful space! Great location! Friendly and responsive hosts! Perfect for our family! Great location! Beautiful house. Very nice town. We enjoyed it very much! I would sugggest this property to everyone. Beautiful Victorian home close to town!